The Hallow's End world event is the World of Warcraft counterpart of Halloween and is meant to celebrate the Forsaken breaking free from the Scourge. The event is much less time-consuming than Brewfest, the preceding world event. You will mostly be running around Azeroth and Outland to visit candy buckets. Other tasks include fighting the Headless Horseman, the boss of the event, do daily quests, or trick-or-treat innkeepers. The event itself takes places all over Azeroth and Outland. Some achievements will require significant travel times to complete. This guide starts with a presentation of the various rewards that you can obtain. Then, we list the various tasks at hand before giving what we feel is the right order for completing them. the loot from the Headless Horsement was updated to item level 335. A number of achievements will automatically be obtained while doing these tasks. The remaining achievements are obtained by collecting and using items. Tricky Treat is the currency of the event, you can earn it by completing daily quests and doing various tasks such as killing the Headless Horseman. With it, you can buy almost all the rewards of the event, including pets and costumes, which are not available through other means, unlike many of the other rewards. By doing all the daily quests and killing the Headless Horseman every day, you can gain about 15 Tricky Treats a day. The event lasts 15 days, so you can gain approximately 225 Tricky Treats from doing your daily tasks. In addition, you can get between 300 and 400 Tricky Treats by visiting the candy buckets all over Azeroth. This means that you can get enough Tricky Treats to complete all the achievements and get a lot of the rewards in the 2 weeks that the event lasts, but you will need at least 2 years to get all the rewards. The event is usually scheduled in such a way that it finishes on Halloween's day. This year, the event will take place from the 18th of October to the 1st of November. The rewards offered by Hallow's End are detailed in this section. Unburdened (Alliance) and Grim Visage (Horde) are buffs that increase your experience and reputation gained by 10% for 2 hours. These buffs are obtained by clicking the bonfires in front of the Wickerman at the entrance of Stormwind City and Undercity. Whenever you complete the Headless Horseman event (putting out fires) in Goldshire, Kharanos, Dolanaar, and Azure Watch (Alliance) or Razor Hill, Bloodhoof Village, Brill, and Falconwing Square (Horde), you will receive Victory!, which gives you a very slight increase in your main stats. This buff seems to persist through raids. 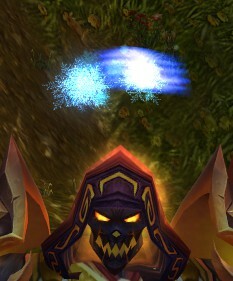 There are also buffs given by masks, which we detail in the Masks section below. Wands allow you to put a costume on a targeted party member. You need to get other people to use them on you to complete the The Masquerade achievement. They are sold by Stymie (Alliance) and Darla for 2x Tricky Treats. They can also be contained in Handful of Treats (candy buckets and daily quests). Masks can be placed over your face or helmet. Collecting them all grants you the A Mask for All Occasions achievement. They are sold by Spanky (Alliance) and Farina (Horde) for 2x Tricky Treats. They can also be contained in Handful of Treats (candy buckets and daily quests) and Loot-Filled Pumpkin (Headless Horseman). The following masks grant a stat buff for 30 minutes when you use them and they can be purchased from the same vendors as the other masks and for 5x Tricky Treats. All of the items in the table below can be bought from Dorothy or Pippi (Alliance) and Chub or Woim (Horde). Some of them can also be contained in Handful of Treats (candy buckets and daily quests) and Loot-Filled Pumpkin (Headless Horseman). Hat of the Youngest Sister (purple). These can be used for transmogrification for the duration of the event. Little Wickerman, Horse Head Costume, Horse Tail Costume, and Headless Horseman's Hearthstone are sold for 150x Tricky Treats by Dorothy (Alliance) and Chub (Horde). Coin of Many Faces and Sack of Spectral Spiders can be obtained during the Garrison daily quests introduced in 2015. 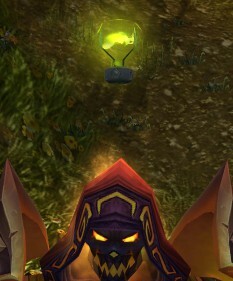 Sinister Squashling is a vanity pet that can be contained in several rewards earned during Hallow's End. This pet is also a requirement for the Sinister Calling achievement, see the related section for more information. Naxxy, Feline Familiar, Cursed Birman, and Widget the Departed are bought with 150 Tricky Treats. Creepy Crate is obtained by completing the A Friend in Need (Alliance / Horde) quest line. Ghastly Rat, Ghost Maggot, and Spectral Spinner are obtained through the Garrison daily quests introduced in 2015. The Horseman's Reins is a mount that has a chance to drop once a day from the Headless Horseman, the boss of the event. Magic Broom and Flying Broom are temporary mounts that you can only use for the duration of the event. Magic Broom can be contained in a chest reward that you get for putting out fires in starting zone villages, while Flying Broom has a chance to drop once a day from the Headless Horseman. Creepy Crawlers, Ghoulish Guises, Hallow's Glow, Seer's Invitation, and Witch's Brew can be obtained by doing the Garrison daily quests introduced in 2015. Wicked Witch's Signet: Spirit Ring. The only location to visit that is not clearly marked on the maps is Deepmist Grotto in Vashj'ir. It is located in Kelp'thar Forest, in a cave just south of the place named Gnaws' Boneyard. In this section, we present the main tasks that you will be required to perform during Hallow's End. Tricks and Treats of Pandaria (Alliance / Horde), not required for the meta-achievement. Completing the first 3 achievements, will grant you Tricks and Treats of Azeroth, which counts towards the completion of the meta-achievement. Masks, needed for the The Mask Task and A Mask for All Occasions achievements. The first time you interact with a Candy Bucket, you will be given the Trick or Treat! achievement. The Headless Horseman is the boss of the Hallow's End event. He is located inside the Scarlet Monastery instance (Graveyard). You can only access him through the Dungeon Finder tool. Once inside the dungeon, interact with the pumpkin on the altar to summon the boss. Phase One: burn the boss until 1% health, then his head detaches and flies to a random location. The head has a separate health pool and you need to damage it until 67% health before the boss' health, which is regenerating, reaches 100%. Phase Two: spread out and burn the boss again (the head is back on the body). At 1% health, the head, once again, detaches and flies to a random location; you need to damage it to 33% before the boss' health regenerates to 100%. Phase Three: burn the boss and ignore the adds. At 1%, the head flies off and you need to finish it off. The first time you kill the Headless Horseman, you complete the Bring Me The Head of... Oh Wait achievement. There are two sets of daily quests available. The first one deals with extinguishing the fires started by the Headless Horseman before defeating him in lower level areas (for this purpose, the Headless Horseman is a level 11 elite mob). The second one deals with preventing the other faction from ruining your celebrations while disturbing their own celebrations. Horde: Falconwing Square in Eversong Woods, Brill in Tirisfal Glades, and Razor Hill in Durotar. There, the Orphan Matron will give you a follow-up quest: Fire Brigade Practice (Alliance: Elwynn Forest/Dun Morogh/Azuremyst Isle) Fire Training (Horde: Tirisfal Glades/Durotar/Eversong Woods). It simply requires you to use a water bucket to put out 5 nearby fires (use the Water Barrel next to the Orphan Matron to refill your water bucket). Accepting this quest unlocks the Stop the Fires! (Alliance / Horde) daily quest. Note that the two-prerequisite quests can only be done once (i.e., they cannot be repeated 3 times, once in each possible location). The idea behind Stop the Fires! is to fight off the Headless Horseman who regularly sets on fire buildings in the village where you took the daily quest (it can be one of the 3 locations mentioned above). Note that this daily quest is not available if the Headless Horseman has recently been fended off. Also, if you do Stop the Fires! in a given location, you will not be able to do it the same day in one of the other 2 locations. Hallowed Wands for the The Masquerade achievement. Stink Bombs Away! (Alliance / Horde): this quest takes you to Undercity (Alliance) or Stormwind (Horde), where you must drop 25 Stink Bombs. You are in the real city, and not an instanced version of it. As such, you can have fun trying to bomb players from the enemy faction! Clean Up in Stormwind/Clean Up in Undercity: this quest requires you to clean the Stink Bombs dropped by players of the opposite faction. They are easily spotted by the amount of orange smoke that they produce. A Time to Gain/A Time to Build Up: this quest requires you to take click the bonfire, next to the big Wickerman, where you took the quest. A Time to Lose/A Time to Break Down: this quest requires you to go to the opposite faction's Wickerman (just outside of Stormwind or Undercity) and douse it with the provided quest item. Each of these quests rewards Tricky Treats and all four of them are available each day. Completing them grants the Rotten Hallow (Alliance / Horde) achievement. 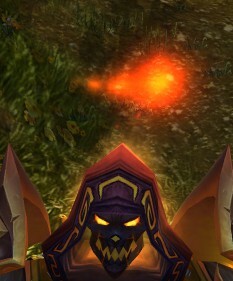 Added in 2015, Culling the Crew, Foul Fertilizer, Smashing Squashlings, and Mutiny on the Boneship are given to you at your Garrison and allow you to collect up to 5x Spooky Supplies per day, which you can in turn use to purchase Garrison decorations: Creepy Crawlers, Ghoulish Guises, Hallow's Glow, Seer's Invitation, and Witch's Brew. You need 5 days of questing to get all of the decorations. When purchasing Creepy Crawlers, you have a chance to summon Arachnis in your Garrison. He has a chance to drop Sack of Spectral Spiders. When using Creepy Crawlers to decorate your garrison, three battle pets will appear in your Garrisona and you can fight them to capture them: Ghastly Rat, Ghost Maggot, and Spectral Spinner. When doing the daily quests, you have a chance to loot Coin of Many Faces from one of the undead mobs. Under the Crooked Tree is given by Hag of the Crooked Tree in Val'sharah. She is located at (35.0,56.1), just north west of Bradensbrook. The daily quest requires you to defeat Aria Sorrowheart (whom you can see only after interacting with the cauldron located next to the quest giver). Aria keeps trying to fear you and other nearby players, so she must be interrupted. Upon completing the quest, you will receive 5x Tricky Treats and Hag's Belongings, which can contain wands and hats. This pet is the reward of a small quest line. A Season for Celebration (Alliance / Horde) serves as an introductory quest. It leads to Hallow's End Treats for Jesper! (Alliance) and Hallow's End Treats for Jesper! (Horde). These quests are not related to the Creepy Crate quest line and should only be done for the 10 Tricky Treats that they reward. What Now? (Alliance / Horde), which eventually rewards you with the Creepy Crate pet. The remaining achievements require you to obtain a variety of items. Each of these items can be obtained in a number of ways, which can make things confusing. Therefore, in the following sections, we give the different sources for all these items. It is contained in the Crudely Wrapped Gift, looted from the fiery pumpkin, after putting the fires out. 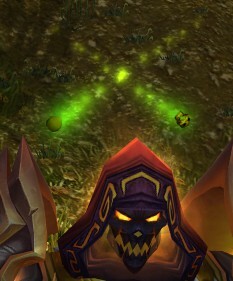 Note that using a Weighted Jack-o Pumpkin on a player already under the pumpkin head effect will consume the item without granting you the achievement objective. It can be contained in a Handful of Treats, obtained after interacting with a Candy Bucket. G.N.E.R.D. Rage requires you to kill members of the opposing faction while being under the buff given by the G.N.E.R.D.S. item. This item can be contained in a Handful of Treats, which you can obtain by completing a candy bucket quest or a putting fires out quest (by opening the fiery pumpkin at the end). It can also be bought from Dorothy (Alliance) and Chub (Horde). Battlegrounds like Alterac Valley or Tol Barad are ideal for completing this achievement. Note that the buff does not persist through death, so make sure to have enough items to rebuff yourself until you reach the 10 Honor Kills mark. Out With It requires you to eat 3 Tricky Treats in very quick succession. Almost every task in the event rewards you with these items, so it will not be hard to get your hands on 3 of them. they can be bought from Dorothy (Alliance) and Chub (Horde) with 150 Tricky Treats each. That Sparkling Smile requires you to obtain and use a Tooth Pick. This item is contained only in Handful of Treats, which you obtain by interacting with Candy Buckets. It is also sold by Dorothy (Alliance) and Chub (Horde). they are bought from the Wand Vendor (at the daily quest hub, just outside of Stormwind or Undercity) with Tricky Treats. A common way to do this achievement is to use the trade channel to ask for a Wand cast exchange with other players (if they have a wand you need and you have a wand they need) or to simply offer gold for Wand casts. We hope that this guide will have answered every question you had about Hallow's End. If not, we encourage you to leave a comment or contact us by e-mail, we will be happy to address the issue you encountered. 18 Oct. 2018: Updated for 2018. 18 Oct. 2017: Updated for 2017. 18 Oct. 2016: Updated for 2016. 18 Oct. 2015: Added the new items introduced in 2015. 21 Oct. 2014: Changed price of Arthas Costume to 500 Tricky Treats. 18 Oct. 2014: Added more information about the new 2014 items.